I dispute that Warhol was a master. His works are not masterpieces. Pingback: News and Headlines. 5/3/2018 – News and Headlines: RoboeAmerican, informing the people. Art moves with times and movements, sometimes it needs new eyes to go with times and movements. A masterpiece is so regardless of the race, gender, ethnicity, sexual orientation, political affiliation, caste, socioeconomic status, or any other aspect of the artist. The work should stand alone. The race of the artist would affect the work in special circumstances such as the quilts made by slaves. This would create a backdrop to the piece. Such fiber arts show the rich fabric scraps gleaned from rich owners, combined with the rough fabrics available to slaves. There was a very special quilt that contained clues to the Underground Railroad. In such cases, absolutely, the race of the artist was a critical feature of the work. This reminds me of a discussion with Jordan Peterson that I listened to the other day while driving. He discussed true diversity. When you are putting together a project, it is advantageous to put together a team with diverse skills, to truly attack a problem from all angles and achieve your goal. Race or ethnicity has no bearing on such a team. It would be diversity of skill that would be a true advantage. In a similar vein, diversity in a museum would be including a range of mediums, periods, and styles. What the devil does the melanin of the artist have to do with it? Patrons and visitors would get so much more out of attending a museum and seeing a wide variety of works, rather than viewing mediocre works bought as a direct result of lowering the bar to meet some internal quota. Selling a masterpiece to obtain anything short of another masterpiece is lowering the bar. Now, if they had an excess of Warhols, and wanted to obtain other master works, then this would make sense. Politics do not belong in the art world. OK, let me rephrase. Understanding of politics can be helpful in interpreting works of art, such as realizing that Da Vinci painted his enemies suffering the torments of hell. But you do not mix appreciate of art with political goals. That’s how you end up with Soviet propaganda art. I would like to add that one of my favorite children’s books authors/illustrators is Jerry Pinkney. He is not my favorite because he’s black, and I’ll feel better as a person if I buy his books. He is one of my favorite illustrators because he’s good. His take on Aesop’s Fable about the lion and the mouse is wonderful. I like the the puts a toad or frog in almost every one of his books, and I’d like to learn why. We should give a boost to artists that we enjoy. That is what patrons do. That is what customers do when they vote with their dollars. By all means, create scholarships for black artists, and introduce the arts into black communities and schools. It should be about opening doors, exploring little known artist, and giving everyone a chance, not lowering standards and making everything try to exactly match the percentage distribution of a population. Why does everything have to boil down to identity politic? It’s exhausting, and it’s not fair, because such aspects cannot be changed. Identity politics is a caste system in America. Did you read the guy’s resume. It sounds like superficial corporate types select someone who is basically a marketing guru. To hell with them all. Last November it was reported that schools in the counties adjoining Baltimore were cancelling field trips into the city, on the recommendation of the Sheriff’s Dept, due to “escalating violence.” This means that kids in the suburbs and rural communities surrounding Baltimore will not be able to visit the Baltimore Art Museum nor the Maryland Science Center. B’more is another Chicago in terms of violence and anyone who ventures there is risking his life. I suspect this move is a publicity stunt to gin up attention for a struggling museum. But unless you’re willing and able to rent a steel-plated vehicle with bullet-proof windows, I would pass on this fairly ordinary museum. There are better offerings in D.C., only 30 or so miles away. Baltimore is worse than Chicago by a factor of 2 or 3. It’s a handsome city in which core business has been neglected for 60 years and wretched misgovernment have been the rule for 30 years. Dissolve the city council, and put the mess under a state appointed trusteeship. I wouldn’t be surprised to discover this is in response to President Trump’s budget proposal to end the NEA. Should the federal government fund racial cleansing programs? Again, beyond a crown jewel like the National Gallery, there isn’t much purpose to federal funding of the arts. Production of art doesn’t benefit from economies of scale or central co-ordination The arts are, to put it crassly, a consumer good best promoted philanthropically. If you insist on public funding, I’d ask you to what degree your state university is cross-subsidized and to what degree the art history faculty therein (and their associated galleries) are cross-subsidized by departments which bring in revenue. That aside, public funding is the preserve of those governments whose ambo is closest to being coterminous to the range of the good in question. You want public funding for Syracuse Symphony, ask the Onondaga County (NY) legislature. You want it for Glimmerglass, find out where the bus tours originate and ask those county legislatures (the NYC Council, in truth). Again? Anyway, if the city of Baltimore or the state of Maryland want the BMA,to express regional and not national demographics, then they should secure regional and not federal funds for such a project. By your logic, Nutchacha, the arts would barely exist outside the very biggest cities. The word ‘logic’ does not mean what you fancy it means. You’re also ignorant of life in most of the country. I hate to break it to you, but there’s strata of services in this country and in any country and these are typically delineated by size, density, and heterogeneity of host communities. You don’t have bourses in every city. You’ve got them in Chicago and New York and Toronto. Research universities can be force-planted just about anywhere by state governments. They thrive naturally only in milieux where you have a dense settlement of about 600,000 people. Ditto teaching hospitals. You can have arts or decorative crafts anywhere you can hang a picture. What you cannot have is a bulbous art gallery or theatre absent a critical mass of patrons. People who live outside that critical mass can commute or they can reconcile themselves to the absence of certain things in deciding where to live. It’s called making trade-offs, and adults do this all the time. If the Onondaga County government wants a subvention for Syracuse Symphony, nothing is stopping them from granting one. If the Cayuga, Oswego and Wayne County governments want to subsidize the Sterling Renaissance Faire, nothing is stopping them either. If the Madison and Chenango County governments want to subsidize the Earlville Opera House and it’s off-beat performances, nothing is stopping them. Have each community subsidize what is of interest to their clientele and apposite for a location of that type. N.B. Phillis Wheatley’s work was published in the late colonial period. In the post-bellum period, the black elite (with white help) was busy building educational institutions while people drawn from the black rank-and-file were making their mark in vernacular entertainment. It doesn’t seem to occur to you that in black American culture, music has pride of place; theatre and dance next; literature after that; and studio art in the caboose. There was a time when black artists found themselves shut out from galleries or museums. Warhol was amusing, not a producer of masterpieces. The stated reasons are just another manifestation of the humbug abroad in educational institutions. Art History and criticism is vulnerable to this because it’s a discipline without robust operational standards of competence. Time to cut budgets and lay people off. Massively. Warhol is considered the most important artist of the 1960’s. Yeah, by the knuckleheads who invested their money and reputation in his stuff. This thought process so FOBR I cant believe it!! Judging from yesterdays blog about the state of education, does it really matter? It’s hard to imagine that a city like Baltimore with over 70% lacking basic education that art will matter to the “constituents”. Will it sell it collection of Hitlers, too? I see Warhol as a studio hack and they are well rid of his work. However, acquisition of significant black artists is not going to be as easy as they think. I agree there are great artists of all colors and ethnicities, but they all have a price tag. They are unlikely to find a black artist with a price tag like their Warhol. good point Paul. As they play their games the artists (contemporary) who don’t fit into convenient slots never get recognition. Hell, look at van Gogh! Pretty much true of any art gallery. It astounds me how artists can command eight figure prices for works, especially those of contemporary artists and for me at least more so “modern artists” who’s technical talent I question. But, it’s whatever someone is willing to pay for it. Aside from purchases made for investment purposes there is something to be appreciated in the simplicity of antiquities. For me they often represent a core human interpretation of their world and thoughts. One can derive the importance of the elements of each work, such as what they value as important in how well they craft each. It also provides us a window into what we were like as people and how society evolved. 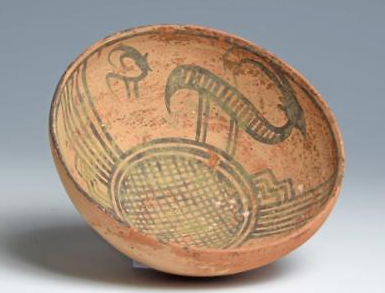 An example of a Nal Culture bowl from the Indus Valley around 2000 B.C. That an item such as this survives millennia and continues to remain interesting is a testament to the durability of simple design and a bit of humbleness. In one way it is in opposition to the genre that Mr. Warhol engendered. Not that his works are not worthwhile or inspiring but for a miniscule fraction of the cost of a Warhol painting, I’ll take history over the transient. Darren, damn good thing this bowl is now in a museum given that that area has been invaded and bombed. Reminds me of the controversy around the Elgin marbles! The Indus Valley runs through Sindh and the Punjab, neither of whom have been invaded or bombed. Have you been watching The Antiques Roadshow? They’re recycling old episodes and then offer an little addendum on each scene indicating what’s happened to the nominal price in the intervening years. Commonly down. It’s atypical to see something appreciating in real terms, in fact. Buy antiques because you’re fond of what you see, not as an investment. Replacing Warhole crap with non white crap is a wash. This week’s sign of the Apocalypse: I agree with wildbill99. I feel sorry for you for not being able to enjoy modern art, specially Warhol. How do you define a good technique? How do you define art? I know art is very subjective, but you might have a very limited definition or understanding of that. Warhol is not just art, it has a unique philosophy. Very original. I like the bowl example you posted. It is beautiful, and given its history makes it a very compelling and alluring piece. There are things which are good and original. It’s just that the parts that are good aren’t…oh, you know the drill. Curious on Enigma’s take on this given he went to Fisk which tried to sell off the works that Georgia O’Keefe specifically donated to that school to raise money. How did that work out? The move isn’t pro-Black it’s anti-white given its public proclamation. If the move suits the museum’s patrons, that’s fine. If not, it will close like every other business that forgets it’s a business and not an instrument of political correctness or racism. The two seem to go hand in hand nowadays. ESPN anyone? mespo – FWIW – one of my fav regional museums is in your hometown. The VMFA is such a treasure! You know it really is a great undiscovered gem. My former neighbor was a curator and helped Suzanne and I discover it. The Faberge eggs rock. I suspect that the artists who created the current exhibitions reflect the Museum’s patrons more than the population of the City of Baltimore. It’ll be interesting to see if they can maintain their levels of financial support. Yup, Wonderer – it’s always about the patrons. Museums make hardly any money from visitors. About 28% of their budget is from government grants, with 17% provided by the Baltimore City Council. If they weren’t fad-chasing bozos, they’d still be vulnerable to the black nationalists on the Council. Very reductive perspective IMO — there are incredible artists from all races/gender(s) and backgrounds producing contemporary art. It will be interesting to see how this plays out for the museum in the long term – will it be able to attract enough sponserships and donations to sustain it with this move into identity politics? Or will it fold and be swept into the dustbin of history? One has to wonder where this large infusion of cash will go. When the leadership of an organization abruptly liquidates assets for inexplicable or questionable reasons it is often is a sign of trouble or at least a harbinger of bad policy to follow. If the museum succeeds on its rebranding then that is certainly laudable however how can one argue the demographics of their potential visitors. Mr. Warhol is renowned internationally and commands an intrinsic draw for customers but if they cut the general appeal of the museum and to specialize in a niche market that will involve greater risk. But with an enormous infusion of cash from the deaccessions, that will certainly help. Darren re: “One has to wonder where this large infusion of cash will go.” Good point – presumably to aquire works by major contemporary black artists? And are these artists African-American or does this include blacks in art worldwide? A private organization is doing as it wishes with its property. Only a true snowflake would be able to gin up outrage on this score. Don’t like it? Don’t donate to the museum. If the works sold truly are masterpieces, no doubt they will be back on display somewhere else in short order. I agree. I hope you also support all white or all male only clubs. It’s not about the art so much as it is about a new flavor of institutional racism being established. IOW, vermin damage an institution and degrade the culture and we’re ‘snoflakes’ for pointing that out. Thanks for the shi! !y little rhetorical game. It’s been an education. You’re both a snowflake and a poor speller. You’re a puerile jack-wagon who cannot defend what you want to defend and resort to nonsensical insults. You’re sincerely bothered by the opinions of people on the internet about things that have nothing to do with you. Go for a walk. Take a deep breath. Reevaluate things. You’re not bothered, but you’ve offered 3 otherwise vacuous comments. Think about a hobby. That might be a good thing to relax you and stop you from freaking out regarding the opionions of people you’ll never meet about places you’ll never go. Now you’ve shifted gears to displays of superciliousness. Edifying. Woodworking. Stamp collecting. Something. You need it.